UCLA historian Robin D.G. Kelley says that as the city observes the 50th anniversary of the Watts Riots, it’s important that we remember places like the Watts Happening Coffee House, which community residents created from the energy of their social unrest. Robin D.G. 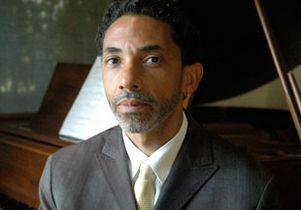 Kelley is the Gary B. Nash Professor of U.S. History at UCLA and author of “Africa Speaks, America Answers: Modern Jazz in Revolutionary Times.” This op-ed was published Aug. 11 in the Los Angeles Times. As we mark 50 years since the Watts riots, expect endless newsreel footage of buildings aflame and National Guard units occupying Central Avenue, experts rattling off gruesome statistics, eyewitness accounts of that stifling hot night on Aug. 11, 1965, when Marquette Frye’s drunk driving arrest became the flashpoint for one of the worst incidents of civil unrest in U.S. history. But a focus on violence and looting reduces the people of Watts to “rioters” rather than residents confronting social and economic catastrophe. What they burned is less important than what they built, both before and after the insurrection. By 1965, Watts faced double-digit unemployment, rampant poverty and a shortage of livable housing. Restrictive covenants, real estate agents, lending institutions and white civic associations conspired to maintain racial segregation. In 1964, California voters repealed the short-lived Rumford Fair Housing Act prohibiting discrimination. Under the guise of “slum clearance,” government-subsidized freeway construction razed black and brown neighborhoods, reinforced segregation and enabled industry to leave the urban core. As conditions in Watts worsened, incidents of police violence multiplied. What the city had not anticipated was a new mood of defiance. In 1961, when police arrested a black youth in Griffith Park for riding the merry-go-round without a ticket, about 200 black men began pelting the officers with rocks and bottles. When police killed unarmed Ronald Stokes during a raid on the Nation of Islam mosque in April 1962, more than 1,000 rallied against the Los Angeles Police Department and demanded Chief William Parker’s resignation. Protests over policing, housing, education, jobs and racial justice erupted with greater frequency. In the two years leading up to the rebellion, some 250 demonstrations took place, including a mass march for school desegregation in June 1963 led by the United Civil Rights Committee and the NAACP. Anger may have sparked the pre-1965 protests, but organization sustained them. Besides the civil rights committee and NAACP, the Urban League, the L.A. County Commission on Human Relations, the Congress of Racial Equality and the Non-Violent Action Committee were all active in South L.A., advancing civil rights priorities. Meanwhile, groups such as the Westminster Neighborhood Assn., the Welfare Action and Community Organization, and the Watts Labor Community Action Committee focused on the more immediate needs of black working people. These groups succeeded in mobilizing large segments of the black community, but they produced very few policy changes. Unemployment, poor housing and police brutality reached a crisis point. Between 1963 and ‘65, police killed 60 African Americans — 25 were unarmed and 27 were shot in the back. As the historian Daniel Widener has documented, a sense of revolt also found expression in a local arts movement dedicated to community self-determination. In 1961, pianist Horace Tapscott founded the Underground Musicians Assn., a jazz collective devoted to community performance and education. In 1964, an accountant named James Woods and poet Jayne Cortez launched Studio Watts, a collective of writers, dancers and visual artists who fought to create affordable housing. That same year sculptor Noah Purifoy became director of the Watts Towers Arts Center and, with fellow staffers R. Judson Powell and Sue Welch, taught art to neighborhood children. In short, Watts was no urban wasteland. Despite poverty and discrimination, a dynamic civil society prevailed. The rebellion grew not from chaos but from a mobilized community seeking change. And six days of violence could not destroy the community or its institutions, although they did change in character. The earlier civil rights orientation gave way to a political culture of Black Power and cultural alternatives to middle-class assimilation. 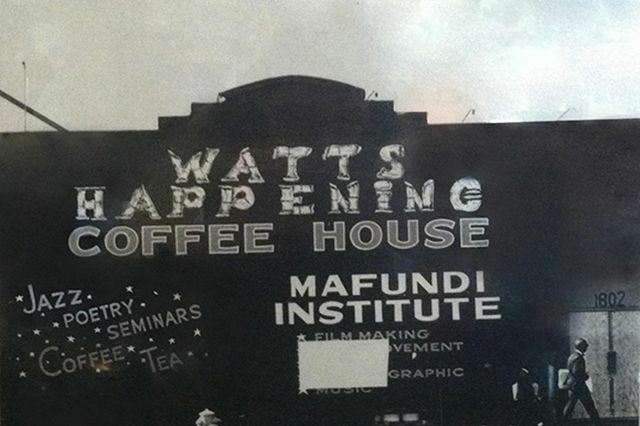 Just two months after the rebellion, in October 1965, activists converted an abandoned furniture store on 103rd Street into the Watts Happening Coffee House, which doubled as a gallery and performance space. 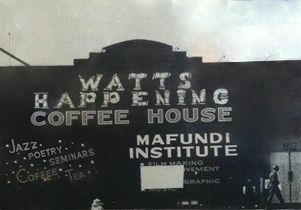 Two years later, it housed a black cultural academy called the Mafundi Institute. Also soon after the rebellion, radicalized street gangs formed the Sons of Watts and later joined the Black Panther Party. Ex-gang banger Ron Wilkins created the Community Alert Patrol to monitor police and document misconduct. Maulana Karenga and Hakim Jamal founded US organization, which promoted African culture and the teachings of Malcolm X as a path to political unity and community revitalization. The new political culture was not without contradictions. Feuds erupted between cultural nationalists, radicals and liberals, and some of the new leaders spewed misogynistic rhetoric. Civil society, however, flourished. Despite sharp differences, these groups shared a desire to end racist policing, improve housing conditions, create well-paying fulfilling work and to transform education to suit black people’s needs. But in the eyes of the U.S.Justice Department and the LAPD, South L.A.’s artists and activists were dangerous sub-versives because of their ties to the Black Panthers and other militant groups. In December 1967, the FBI added the Underground Musicians Assn. to a growing list “black nationalist hate-groups” targeted for surveillance and disruption. FBI agents and local police monitored and harassed Horace Tapscott, the Watts Writers Workshop and the Watts Happening Coffee House. One FBI informant torched a beautiful 350-seat community theater that had been converted from a Safeway supermarket. Ultimately the government devoted more resources to arresting Watts’ insurgent democracy than to creating jobs and affordable housing. It did not succeed completely; Tapscott, poets such as Kamau Daaood and various black artists regrouped in Leimert Park, birthing a new renaissance centered on the World Stage, Brockman Gallery and Eso Won Bookstore. Still, given the state’s hostility to Watts, is it any surprise that the neighborhood experienced a downward spiral? Cuts in social spending, declining home values, the hemorrhaging of jobs and the flight of middle-class African Americans deepened poverty. Watts offers us valuable lessons as we commemorate the one-year anniversary of Michael Brown’s shooting Aug. 9 and the rebellion that pushed Ferguson, Mo., to the top of the news cycle. We should not allow footage of the Quiktrip Convenience Store in flames to obscure what has grown up in its ashes. Groups such as the Ferguson Response Network are doing what the people of Watts tried to do: building civil society through programs such as Books and Breakfast. Modeled on the Black Panther Party’s free breakfast program, they have created space to engage locals on social justice issues and develop new models of political education. The fires, then and now, are not the point. The desire for a functional, free, even beautiful community existed well before the first Molotov cocktail was thrown and continued long after the last arrest.